'Time Is Short' On Debt Ceiling, Treasury Secretary Says : The Two-Way Jacob Lew says the limit on borrowing needs to be raised before the end of the month. Otherwise, he warns, the federal government risks defaulting on its debts — and Lew says that could cause serious damage to the economy. Warning that "simply delaying action on the debt limit can cause harm to our economy," Treasury Secretary Jacob Lew repeated Monday that he believes Congress should act soon to raise that limit so the federal government avoids even looking like it might default on its debts. "Time is short," Lew also told an audience at the Bipartisan Policy Center, a Washington, D.C.-based nonprofit organization founded by four former Senate majority leaders — Republicans Howard Baker and Bob Dole; and Democrats Tom Daschle and George Mitchell. A transcript of Lew's speech is posted here. Treasury Secretary Jacob Lew on Monday. Thanks to an agreement reached last October, the government's ability to borrow to help pay its bills was extended through Feb. 7 — this coming Friday. In a conversation Monday with All Things Considered host Melissa Block, Lew said that Treasury can make adjustments to its accounts that allow the government to keep paying its bills a bit beyond this week — but only through the end of the month at most. 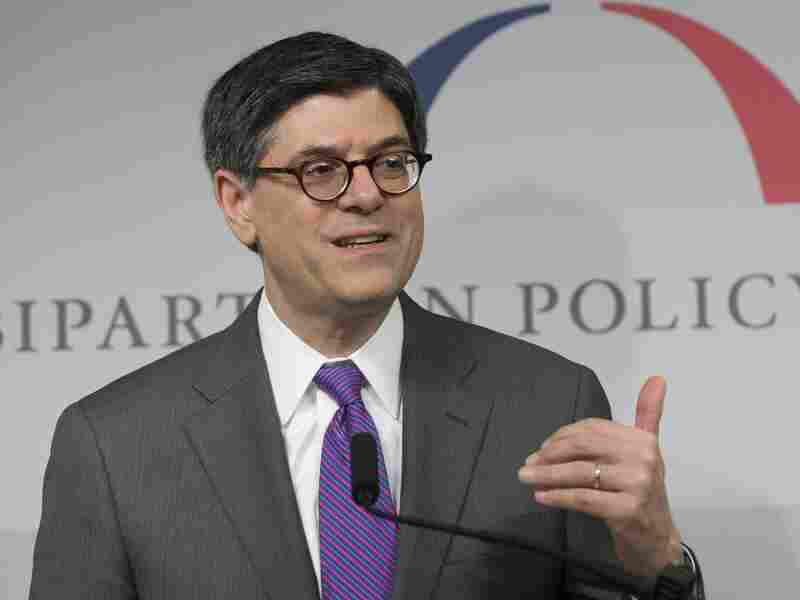 Treasury's ability to use such "extraordinary measures" will then run out, Lew said. Republican leaders in Congress have said they do not want another showdown over spending or health care such as the one last October that led to a partial shutdown of the government. And Lew said he is optimistic that an agreement to raise the debt limit above its current level — approximately $17.2 trillion — will be reached soon. But in his conversation with NPR he also pointed to what he believes is the flaw in the argument by some lawmakers that the limit should not be increased unless equivalent spending cuts are made. "Just a few weeks ago," Lew said, "Congress enacted a budget — a two-year blueprint. Just a few days ago, Congress enacted an appropriations bill pursuant to that two-year budget. Now the question is, will we pay the bills that that budget calls to be racked up? I think that the notion that after Congress passes a budget, to then demand additional budget cuts in order to pay the bills that were already incurred, doesn't make any sense." A default, he warned, could cause serious damage to the economy by shaking investors' confidence in the ability of the U.S. to pay its obligations.